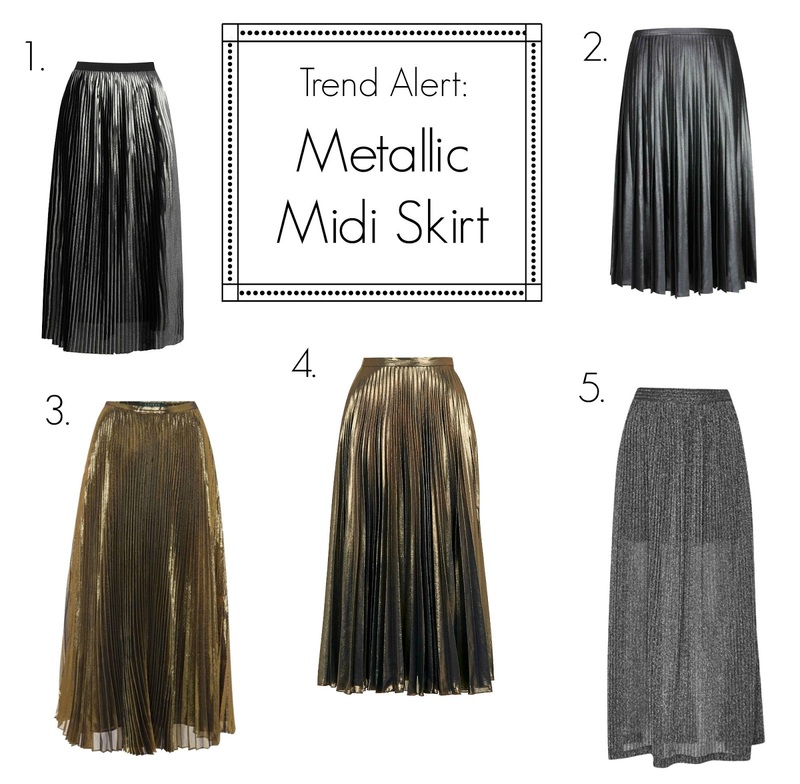 Its official ladies, the only trend you need to be coveting this festive season is the pleated metallic midi skirt. They’ve literally just hit the stores all over the high street and interwebz and I am head over heels in lust! 1. The Warehouse Pleated or “Plisse” skirt is bang on trend with a space age metallic skirt that is available in both silver and gold. This skirt is exactly what this trend is all about, shimmery, shiny and just plain Sha-mazing! 2. Ted baker’s Zainea skirt is a beautiful charcoal, almost matte metallic skirt. It looks absolutely stunning with a black top. Definitely something that can be worn to the office without anyone batting an eyelid, well other than to tell you how gorgeous you look in it, of course! 3. Ralph Lauren has gone for gold this season and in my eyes certainly, they’re winning with this shimmery number. 4. Topshop have gone outside the box a little and used different textures (brocade) and colours (yes, purple!) in their collection but my absolute favourite from them is the bronze metallic midi skirt. It’s one of those that you could so easily wear to the office in the morning and switch it up a little once you’re done to have a good old boogie at your Christmas do. 5. French Connection have gone for an understated metallic midi this season with their Flicker Rib skirt. If you’re too afraid to go full on metallic then this skirt is the one for you. It’s much easier to transition from day to night with this one and would look super cute even after the festive season is over. It’s about time you ditched that sequined dress you seem to be reaching for year after year and shake things up a little with one of these metallic beauties. Which is your favourite?